Last week, my forthcoming book cover was approved by Columbia University Press. I wanted to explain the cover and share some primary sources related it. 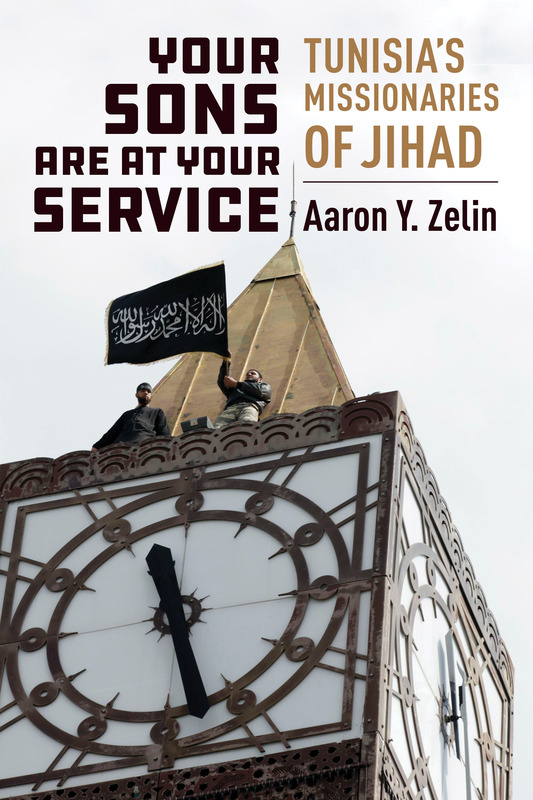 The cover shows members of Ansar al-Sharia in Tunisia on top of Horloge De L’avenue Habib Bourguiba (The Clock Tower on Habib Bourguiba Avenue) in central Tunis. This clock tower is a 2001 renovation of the original so-called ‘Alarm Clock’ (see below) that was installed in the aftermath of former Tunisian president Bin ‘Ali taking power on November 7, 1987 after deposing modern Tunisia’s founding president Habib Bourguiba. The reason AST members were on top of the clock tower was because of a rally for sharia on March 25, 2012. The image of AST members symbolically occupying the clock tower with their black flag left many on the secular-left wondering where the country might be heading. AST was attempting to show that a new era had begun and that the past secular state was receding. Many even chanted: “the people want a new caliphate.” Mind you, this was more than two years prior to IS announcing that itself was a caliphate. Therefore, I felt this image that is my book cover is representative of AST’s project and how it played out locally due to the layers of meaning it had related to the past and future of Tunisia. The spectacle of AST’s overly aggressive show of force backfired. A few days after the protest, al-Nahdah, the leading party in the Constituent Assembly at the time decided to abandon its push for a provision in the draft constitution about sharia being the sole source of legislation in Tunisia. This decision was partly inspired by the severe backlash against the AST rally and the belief among many on the secular-left that al-Nahdah’s “light touch” approach provided cover for AST. Consequently, there was an outpouring of negativity, which al-Nahdah did not ignore, especially considering its lack of a majority in the Constituent Assembly. I get into this episode in a lot more detail in my forthcoming book. Guy speaking: this play is being performed in front of the national theater [national government]. They know that there is another protest taking place. They want to evoke us and tire us. I tell them the people of God will stay strong. They are the ones who know mostly about their rights. Die of jealously. To the minister of interior and to the president you give seculars a permit to protest and shut down Habib Bourguiba street. That protest was a billion-people protest not a million-people one. And we were a minority as you said and as this hypocrite media is saying, but how you give a right to some people and take it from others. We are Tunisians, we have the same rights. We are all Tunisians on this land. This is forbidden, it is to evoke us. It is unjust. We all have the same rights. Abu ‘Iyadh: I salute you in the Islamic way. I salute the people of paradise, and peace upon you. This is a day on which we witness what no one was able to dream of on this planet. The land of the Sahabah which they filled with their blood in order for Islam to reach us. On this day we show that the religion of this land is Islam. And it is not possible for the enemies inside or outside it no matter how strong they are or how many weapons they have to defeat Islam. Islam is the religion of God and it can never be fought against. No matter how much they fight it, they will lose. The religion of God is victorious. This is the promise of God and his Prophet. Today you showed, my beloved ones, despite your difference that you are followers of Muhammad, peace upon him, and that you care about your religion and values. By being present, you declare your absolute loyalty to Islam, God’s book, and Sunnah. You declare that regardless of your disagreements you unite together in defense of God’s book. The first message is addressed for the Zionist-Crusader West, we tell them that we know that you have been plotting for years and especially since your agent Ben Ali left in order to end Islam on this land. We tell you that you will never win. You tried in Afghanistan, Iraq, Chechnya, and Somalia. But you lost one time after another. So if you want to do that again, then the people of Tunisia and the descendants of Uqba bin Nafi’ will give up themselves.. This Muslim nation will accept hunger, no shelter, and displacement in solidarity with God’s religion. So it doesn’t matter how much you plan and plot. You will not be able to touch Islam, never. And you won’t be able to remove it from our hearts. Our message to the people of the secular, the enemies of God’s religion: this is your chance to repent. Otherwise you will not be able to hurt Islam. No matter how high your voice gets and no matter how your media distorts the truth, no matter how you plan and plot, the people of Islam are here to stop you. I swear this is your historic moment to repent to your God and religion. Go back to your religion, God is forgiving and merciful. Repent to God. This is our advice. We will not be evoked by you. Our response to you will be through such protests. Even if your voice is high today, our Muslim nation is not listening to it. But is you refuse to repent and go back to your origins, then I tell you again to pack your bags and leave this blessed land. The third message is to the people in government: I tell them that the youth of Islam who is proud to follow its nahj [way] will not be manipulated. We will not get your permission and we will never ask for it. If God is willing, you will not be able to divide us. And I also tell you and your leader Abdallah Kallel, to fear God. Your responsibility is to make the nation safe and not to make them fear Islam. You are today creating a new dictatorship, but this Muslim nation will not be tricked. Our youth will not listen to you or to your leaders. I tell him, the people don’t have a problem with religion or with any Islamic faction, the people are Muslims whether you or the enemies of God like or not. The people want to ensure a good future, the people put you in this position to fight corruption. So work on what benefits the people and don’t create a new dictatorship. Our message to all Islamic factions: fear God and his religion. This battle is between faith and infidelity. Don’t make it a battle of methods or preferences. Today is a battle between Islam and infidelity. Let’s put our argument aside and look at the danger facing us and threatening our religion. We must not be a puppet in the hands of the enemies of God. Otherwise we will regret it one day. My message to my brothers who share with me this manhaj: the enemies of religion want to make us fuel for this battle. This is not our battle. We have a message to tell this nation about our manhaj, religion, and da’wa until Islam is strengthened on this land. My brothers, be smart, logical, and don’t work individually. Consult with your da’wa men and sheikhs and don’t do something you might regret. Never become a fuel of this battle that is plotted by the enemies of God. My brothers I tell you that Islam is going to rule this land.